The famed Vietnamese Pho is without a doubt an excellent dish – succulent thin slices of beef dumped with fresh herbs in a stock of tasty broth. It’s no wonder travelers to Vietnam would often go searching for the ultimate pho. But the country’s noodle treats is more than just that, and travelers would often miss out on Vietnam’s other noodle treats. 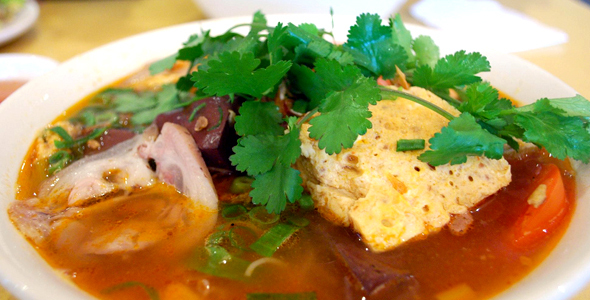 Here are a few of the best Vietnamese noodles, for the adventurous gourmand. Literally meaning Phnom Penh Noodle Soup, this is a Cambodian-Chinese concoction that was tweaked to the Vietnamese palate. Nam Vang is the Vietnamese word for Phnom Penh, so you can actually find various versions of Hu Tieu (Noodle Soup) in Vietnam, with Hu Tieu Nam Vang being one of the more popular noodle soup around. The dish is a surf-and-turf mix of cooked pork, thinly sliced beef, shrimp and group pork with light vermicelli in a sweet and savory broth. The essential garnishes are important here, Chinese celery, chives, cilantro and lettuce adds an extra layer of taste into this tasty dish. Hailing from North Vietnam, the Bun Rieu Oc (Snail Soup with Crab Paste) is a dish featuring chunks of snails and crab roe on top of a sweet-savory broth. The dish is studded with pork ribs, tomatoes, water spinach, sliced banana blossoms, fried tofu and more, topped with the ever popular rice-noodles. The Bun Rieu is hearty, light and refreshing, but also a very complex dish, with the various flavors and textures of the snails, crab and pork ribs mixed together. 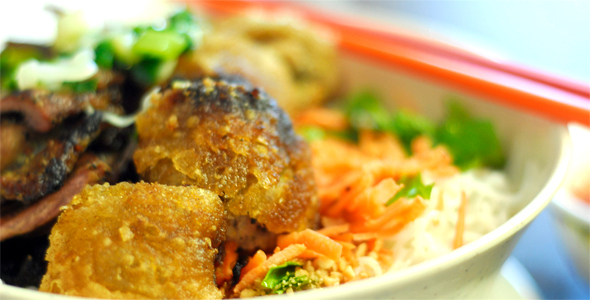 This local favorite is a simple dish that is more salad than soup, a welcome break from the usual soupy-broth on Vietnam’s other favorite dishes. Literally meaning Grilled Pork with Rice Vermicelli, this dish features grilled marinated pork chops served cold on top of rice vermicelli. As is the usual in Vietnam, a host of fresh herbs accompanies the dish – Thai basil, carrot and radish pickle, as well as cucumbers, bean sprouts, and crushed roasted peanuts. Add a dash of fish sauce and chilies according to personal preference, then enjoy the collision of flavors and textures. If you are traveling to Vietnam, make sure to check out some of the most exciting things to do in Hoi An at night. 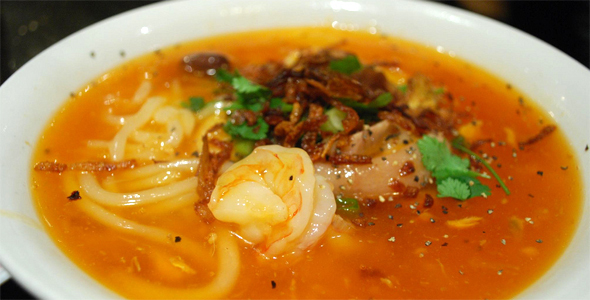 Banh Canh noodles are like the Vietnamese version of udon – they are thick and chewy, although they are typically made with tapioca or rice flour instead of wheat. There are various versions of Banh Canh, and the Banh Canh Cua (Thick Noodle Crab Soup) is one of the more popular amongst them. The Banh Canh Cua features chunks of crab meats and shrimp balls paired with the chewy thick noodles in a crimson broth garnished with chopped scallion. And finally of course, it would be remiss to talk about Vietnamese noodle treats without mentioning the popular noodle dish that is Pho. 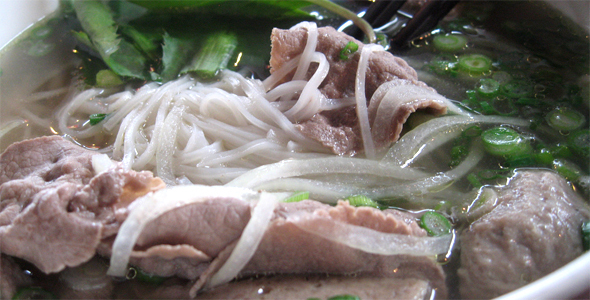 The Pho Bo Tai is a version of Pho with Half-Done Beef Fillet, featuring half-done thinly sliced beef with white rice noodles dumped in a clear soupy broth. The broth is the most important fixture of the dish, and the hardest to make as well, usually by simmering beef bones, oxtails, charred onion and spices for several hours. The dish is then topped with cilantro, basil, lime, bean sprout and onions.